During almost any sort of exercise, you inevitably sweat. This sweat can cause dead skin, excess oil and even bacteria to become trapped in the pores of your skin. Clogged pores allow bacteria to quickly multiply and often triggers an inflammation within the walls of your follicles, prompting the formation of what is commonly known as a sweat pimple. Because this type of blemish belongs to the acne vulgaris family, treatment involves standard skin care practices. Shower after exercise. Showering helps clean the pores of any dead skin, oil or bacteria that may have become trapped from sweat. Wash problematic areas twice a day. Any areas of the skin that are prone to developing sweat pimples should be washed twice a day. 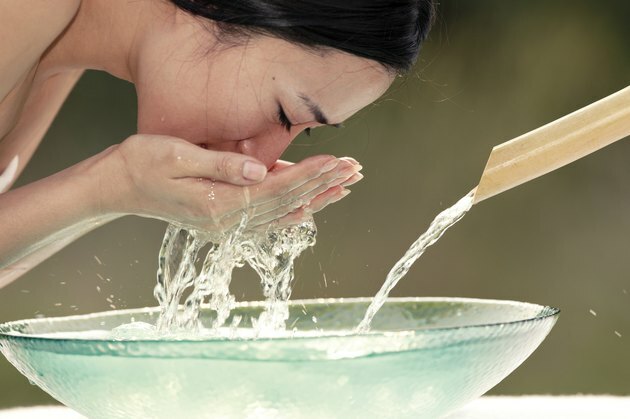 Use a gentle, non-drying cleanser to avoid irritating the skin. Clean exercise apparel after each use. Bands, cuffs and collars of gym clothes tend to trap sweat, oil and other particles more than other articles of clothing. By wearing soiled garments, you'll compound the problem and worsen the condition of your skin. Assess your exercise apparel. Workout attire that fits tightly can aggravate the skin and potentially causing pimples. Opt for loosely fitted clothing whenever possible. Keep your hair off of your face and neck for the duration of your workout. Hair can help trap excess oil, dead skin and bacteria within your pores. Start using an over-the-counter acne cream on problematic areas. Daily application of an acne cream can help to dry excess oil, kill bacteria and prompt some peeling. Peeling essentially exfoliates the skin, removing the dead cells and dirt that may become trapped in the pores. Talk to a dermatologist about a prescription acne medication. If the over-the-counter cream fails to provide results, you may need to use a stronger medication to treat the sweat pimples. Retinols are the standard course of care, but your dermatologist may recommend another form of treatment. Prescription acne creams are more apt to cause side effects than their over-the-counter counterparts. You may experiences some redness, stinging or burning along application sites.